Easy tilting floating axle to minimise effort required to tilt heavy loads backwards. Your choice of Pneumatic or puncture proof wheels. Powder Coated RHS Structual Steel. 1290mm x 370mm Frame size. Multi Grip Loop Handle. The Load Support System provides full height, flat surface RHS frame for secure support of double box stacks. 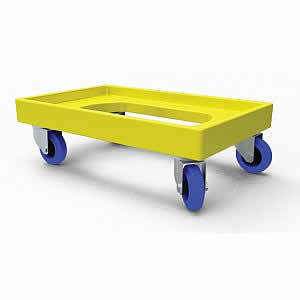 For example you can carry 13 cartons of beer safely with this trolley instead of 7 with most others. Suitable for heavy loads of boxed & bagged products. 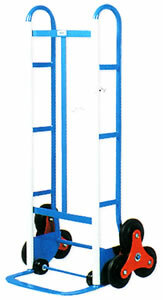 Teamstar 5' Appliance Trolley - Pneumatic Wheels. Suits 200 Litre (44 Gallon) Drums. 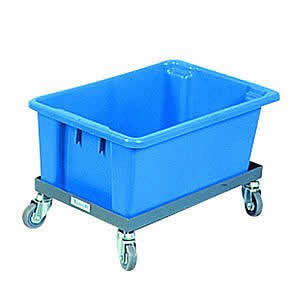 Industrial quality trolley used across many industries.Designed to meet the highest demand applications industries have to offer. Solid Steel construction, Ergonomic and Stable, Safe handling of stacker chairs. Fits most chair types. AUSTRALIAN MADE. Crate dolley. Suits no. 7, 10 & 15 crate. 4 x 100mm castors. Powder Coated RHS & Structural Steel. 1290mm x 370mm Frame Size. safely with this trolley instead of 7 cartons with most others. e.g. drink products, frozen food, flour, tiles, appliances & furniture. 1400mm x 370mm Frame Size. The Load Support System provides curved support with 60mm set back. is not required, simply rotate the mounting collar sideways out of the way. Suitable as a Multi Purpose Trolley. car & truck parts, paint cans, appliances & large boxed goods. Featuring your choice of puncture proof or pneumatic wheels Team Star Hand Trucks are designed and manufactured to meet the most demanding applications industries have to offer. Mighty Tough by name, Mighty Tough by nature – suitable for loads up to 300kg, Richmond’s versatile hand trolley is designed for long term heavy duty use. Built to last, the frame is manufactured using heavy duty steel pipe (not 1 inch wall tube) and designed using Richmond’s 50 plus years of material handling experience. Heavy duty 3 piece steel rim pneumatic wheels with precision ball bearings are the answer for absorbing rough ground, protecting the load and ensuring safe and efficient use day in day out. Optional 300mm diameter wide treaded pneumatic wheels suitable for use on a variety of surfaces including soft ground. 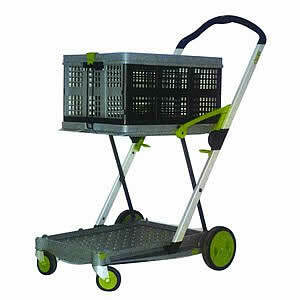 Puncture proof wheels are also available to suit Richmond’s Mighty Tough Hand Trolley. 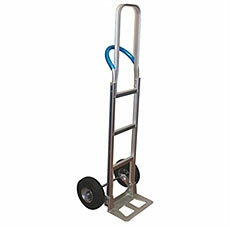 Manufactured from robust aluminium extrusions, this 2 wheeled trolley is a perfect choice when the unit has to be lifted in and out of trucks all day. Its light weight, but high strength makes it the model for professionals. The high back makes it popular with removalists due to the ease with which it can handle heavy and awkward items. Again fitted with high quality pneumatic wheels designed by Richmond, maximizing performance, safety, reliability and efficiency. This Richmond hand trolley comes with a range of optional toe plates to suit your load, providing the utmost in safe handling. Puncture proof pneumatic wheels are another viable option. 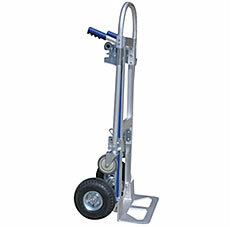 Manufactured from robust aluminum extrusions this is the ultimate trolley for delivery trucks. Light in weight but with high strength the 2 wheeler easily converts by the pull of a spring loaded lever into a versatile 4 wheel platform trolley. It is simple to load and highly maneuverable, featuring an ergonomic handle in either position with ultra safe operation. Again fitted with the highest quality pneumatic wheels and polyurethane tyred castors, designed to maximize performance, safety, reliability and efficiency. This Richmond Dual Purpose hand trolley comes with a range of optional toe plates to suit your load, providing the utmost in safe handling. Foam filled puncture proof pneumatic wheels offer another option for use on open ground. Featuring your choice of Puncture Proof Wheels* / Pneumatic Wheels as options. 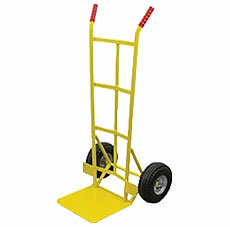 TeamStar Hand Trucks are designed and manufactured to meet the highest demand application industries have to offer. Introducing our Exclusive Modular Range of AluTruk* Aluminium Hand Trucks which have been designed with the professional user in mind. For full specifications, visit Team Systems website here. Another Quality Imported product from the UK. - Increase Productivity by carrying double the volume. - 500kg Load Capacity (Tested in Four-Wheel Mode).